Successfully Added Wireless IP Security Camera with Pan and Tilt (IR Cut-Off Filter, Nightvision, Motion Detection) to your Shopping Cart. Worried about security? Then we have found the perfect peace of mind security device available in the market today. This is an IP Security Camera that has it all and at a low, low price: IR cut-off filter for higher quality video, nightvision, email alert, motion detection, quad screen viewing, remote pan and tilt maneuvering, and so much more. The advanced IR filter in this IP Surveillance Camera delivers great clarity and image quality. Used with CMOS imagers, infrared (IR) cut-off filters produce accurate color images. With the help of this technology every detail appears more clear and more distinct, allowing you to easily identify people and recognize objects. Along with the built-in automatic IR lights for nightvision, you can also see in environments with very poor lighting conditions or even in complete darkness. With just a few clicks of the mouse, this IP security camera is set up and ready to go, allowing you to go online from anywhere in the world and see a live video feed of your IP camera. Along with the remote pan/tilt capabilities and 60 degree viewing angle, this IP camera is sure to let you see everything. Not to mention, you can even remotely manage its whole array of functions, including recording video, setting up motion detection alarms, email alerts, and so much more. 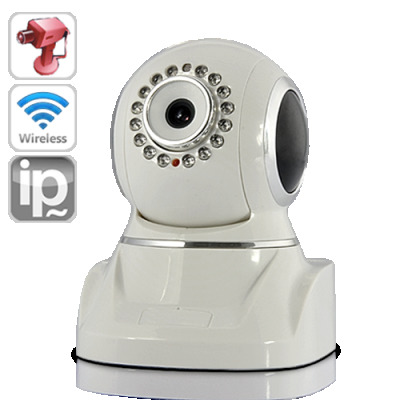 Keep your home and business under 24/7 surveillance with this wireless IP security camera. Supports up to 9 users online simultaneously!